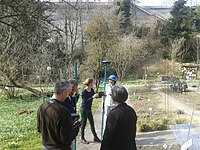 North SmaRTK GNSS RTK receiver being used to survey the forest population in Switzerland. The distance between a satellite navigation receiver and a satellite can be calculated from the time it takes for a signal to travel from the satellite to the receiver. To calculate the delay, the receiver must align a pseudorandom binary sequence contained in the signal to an internally generated pseudorandom binary sequence. Since the satellite signal takes time to reach the receiver, the satellite's sequence is delayed in relation to the receiver's sequence. By increasingly delaying the receiver's sequence, the two sequences are eventually aligned. The accuracy of the resulting range measurement is essentially a function of the ability of the receiver's electronics to accurately process signals from the satellite, and additional error sources such as non-mitigated ionospheric and tropospheric delays, multipath, satellite clock and ephemeris errors, etc. RTK follows the same general concept, but uses the satellite signal's carrier wave as its signal, ignoring the information contained within. RTK uses a fixed base station and a rover to reduce the rover's position error. The base station transmits correction data to the rover. As described in the previous section, the range to a satellite is essentially calculated by multiplying the carrier wavelength times the number of whole cycles between the satellite and the rover and adding the phase difference. Determining the number of cycles is non-trivial, since signals may be shifted in phase by one or more cycles. This results in an error equal to the error in the estimated number of cycles times the wavelength, which is 19 cm for the L1 signal. Solving this so-called integer ambiguity search problem results in centimeter precision. The error can be reduced with sophisticated statistical methods that compare the measurements from the C/A signals and by comparing the resulting ranges between multiple satellites. The improvement possible using this technique is potentially very high if one continues to assume a 1% accuracy in locking. For instance, in the case of GPS, the coarse-acquisition (C/A) code, which is broadcast in the L1 signal, changes phase at 1.023 MHz, but the L1 carrier itself is 1575.42 MHz, which changes phase over a thousand times more often. A ±1% error in L1 carrier-phase measurement thus corresponds to a ±1.9 mm error in baseline estimation. In practice, RTK systems use a single base-station receiver and a number of mobile units. The base station re-broadcasts the phase of the carrier that it observes, and the mobile units compare their own phase measurements with the one received from the base station. There are several ways to transmit a correction signal from base station to mobile station. The most popular way to achieve real-time, low-cost signal transmission is to use a radio modem, typically in the UHF Band. In most countries, certain frequencies are allocated specifically for RTK purposes. Most land-survey equipment has a built-in UHF-band radio modem as a standard option. RTK provides accuracy enhancements up to about 20 km from the base station. This allows the units to calculate their relative position to within millimeters, although their absolute position is accurate only to the same accuracy as the computed position of the base station. The typical nominal accuracy for these systems is 1 centimetre ± 2 parts-per-million (ppm) horizontally and 2 centimetres ± 2 ppm vertically. Although these parameters limit the usefulness of the RTK technique for general navigation, the technique is perfectly suited to roles like surveying. In this case, the base station is located at a known surveyed location, often a benchmark, and the mobile units can then produce a highly accurate map by taking fixes relative to that point. RTK has also found uses in autodrive/autopilot systems, precision farming, machine control systems and similar roles. The RTK networks extend the use of RTK to a larger area containing a network of reference stations. Operational reliability and accuracy depend on the density and capabilities of the reference-station network. A Continuously Operating Reference Station (CORS) network is a network of RTK base stations that broadcast corrections, usually over an Internet connection. Accuracy is increased in a CORS network, because more than one station helps ensure correct positioning and guards against a false initialization of a single base station. ^ Wanninger, Lambert. "Introduction to Network RTK". www.wasoft.de. IAG Working Group 4.5.1. Retrieved 14 February 2018. ^ Mannings, Robin (2008). Ubiquitous Positioning. Artech House. p. 102. ISBN 978-1596931046. ^ RIETDORF, Anette; DAUB, Christopher; LOEF, Peter (2006). "Precise Positioning in Real-Time using Navigation Satellites and Telecommunication". PROCEEDINGS OF THE 3rd WORKSHOP ON POSITIONING, NAVIGATION AND COMMUNICATION. CiteSeerX 10.1.1.581.2400. ^ Gakstatter, Eric. "RTK Networks – What, Why, Where?" (PDF). www.gps.gov. USSLS/CGSIC Meeting 2009. Retrieved 14 February 2018. ^ US Department of Commerce, NOAA; US Department of Commerce, NOAA. "National Geodetic Survey - CORS Homepage". www.ngs.noaa.gov. Retrieved 2018-12-11. ^ Gakstatter, Eric (21 March 2013). "RTK GNSS Receivers: A Flooded Market?". gpsworld.com. GPS World. Retrieved 14 February 2018. ^ "Emlid". emlid.com. Retrieved 8 February 2019. ^ "North Surveying". northsurveying.com. Retrieved 14 February 2018. ^ "Hi-Target-Surveying the world,Mapping the future". en.hi-target.com.cn. ^ "GPS & GNSS Equipment, Products & Solutions". NovAtel. Retrieved 14 February 2018. ^ "ANavS - Advanced Navigation Solutions". anavs.de. Retrieved 14 February 2018. ^ amin, rashed. "CHCNAV - Make your work more efficient". www.chcnav.com. Retrieved 14 February 2018. ^ "GIS,gps receiver,glonass receiver,surveying instruments,rtk gps,gnss". www.sunnavtech.com. Retrieved 14 February 2018. ^ "Beijing UniStrong Science & Technology Co Ltd: Company Profile". Bloomberg. ^ "Starfire™ 6000 Receiver | Guidance Solutions | Precision Ag Technology | John Deere Australia". www.deere.com.au. Retrieved 2019-02-05. RTK Detailed Concepts GNSS, RTK and Satellite Positioning concepts in depth. CORS Map Global Network of Continuously Operating Reference Stations. GBAS Map Global Map Coverage of Ground Based Augmentation Reference Beacons (GBAS).